If there is one must during Valentine’s Day is having soft hands and with the Trio of All Good Products Lotion’s you can win, you can ensure your hands are soft and ready to be held. IN addtion, All Good has their #ReefFriendly campaign, which the goal is to spread awareness to make sure that the products on our skin, are also safe for the underwater reefs. This entry was posted in Giveaways, Personal Products and tagged Body Products, giveaway, giveaways, Lotion, ValentinesDay2018 on January 6, 2018 by Jennifer. When we are young we do not consider that the hands, hair and body we have is the only one we are given, and this must make it last in the best condition possible. I am a crafter, and as a crafter I end up washing my hands many times, and this can cause them to dry and crack. It also happens when I do not drink enough water. As I have approached the age I am currently (almost 6 months into 40) I realize that keeping my skin and hands healthy is paramount next to my internal health. I have done previous reviews for Shoplet in the past and each time I discover a useful item and this product review is no different. I was sent Medline Remedy Phytoplex Nourishing Skin Protectant Barrier Cream Cloths and Medline Remedy Phytoplex Nourishing Skin Cream – Moisturizer. The Medline Remedy Phytoplex Nourishing Skin Protectant Barrier Cream Cloths are thick and soft clothes. The clothes come or pre-moistened but that they are not sopping wet, but rather nicely moistened. The clothes leave skin feeling clean and moisturized and the cloths are non-irritating, non-sensitizing and have been pediatrician and dermatologist tested. The only precaution is that these are NOT flushable, so keep that in mind when using them. Each package has 8 thick pre-moistened cloths per package. This entry was posted in Personal Products, Reviews and tagged cloths, Lotion, medical supplies, office supplies, Shoplet on December 15, 2015 by Jennifer. One of my favorite scents is Lemon, well not just scent but also lemon flavor anything. I went on a chain of meals that consisted of lemon chicken and nothing else. I felt bad for my husband Jason that his pallet was not receiving any sort of flavor stimulation. Flavor aside, I love the freshness of a good lemon scent and will usually purchase the item in question. Back in July I had the opportunity to review Infusion Organique by Cosmetix West. The candle that I reviewed remains one of my favorite candles, and is only burned on special occasions. 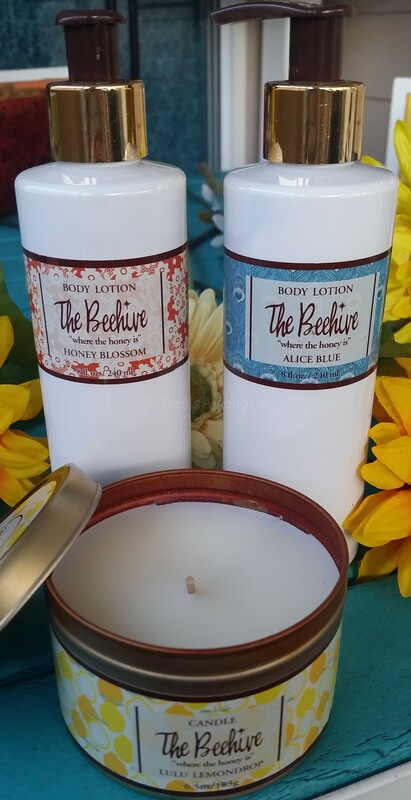 When I was doing my research for that review I saw that they had a couple different brands under the Cosmetix West umbrella – one of them being “The Beehive“. This entry was posted in Giveaways, Personal Products, Reviews and tagged body lotion, eaudeparfum, giveaway, lemon, Lotion, Perfume, product review on December 12, 2015 by Jennifer. Let me start by saying that the products featured in this post were provided to me free of charge courtesy of Anatomicals/Aspire Brands. This post may have affiliate links but this in no way will influence the review to follow and all opinions are my own. I have mentioned before that I did not grow up a girly girl. I avoided make-up other than special occasions, really never got the appeal of heels (this may be in part to being 5’7 and not wanting to over tower people). I never really collected or used scented lotions or body scrubs either. Then there was a shift that occurred and all of a sudden it became an enjoyable activity to collect and use these scented products and I began my collection. Since this discovery I enjoy soaps, body lotions, and everything in between. I have discovered that I like the fruit smells over the floral, but love the floral scents and could not choose a true favorite. The fruit combinations are not only fragrant smelling but the fruits that are used have benefits are also included. I love when I discover a company who uses this combination to create quality body products – enter Anatomicals products. Anatomicals was launched in New Zealand and whose products are all paraben free. The reason that the products being paraben free is a good thing is because parabens are the preservatives included in many beauty products. Parabens are used in shampoos, conditioners, shaving gels, personal lubricants, make-up, toothpaste as well as many other beauty products. Without the parabens included you end up with a much more natural product. This entry was posted in Personal Products, Reviews and tagged Lotion, product review, Soap on July 29, 2015 by Jennifer.